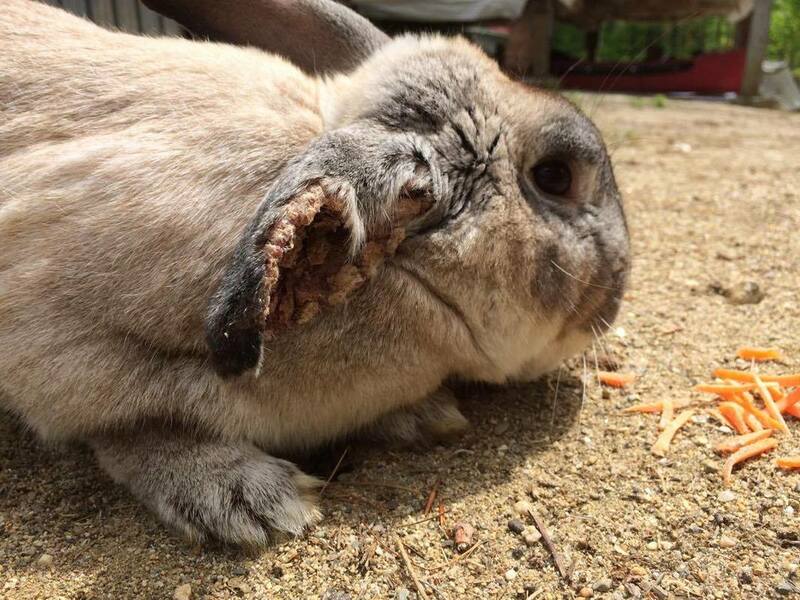 Achilles was left to fend for himself, living in a neighborhood for the last four years with a badly-mended broken leg and an extreme case of earmites. For four long years, people watched him suffer and did nothing. What will you do? Achilles before we rescued him living at the trailer park. You can see the bark-like growth or earmites. (Written by, CCRR founder, Jenny Nichols) "Just when you think you've seen it all you soon realize you haven't. CCRR stepped in and rescued a bunny who was found under a lady's trailer with an extreme case of ear mites and a badly-mended broken leg. Apparently, the lady had just moved to the area. This bunny belonged to a neighbor who "let it go" and she was told it had been eating from trash cans around the neighborhood for the last four years! She was also told his leg had been broken the entire time. Incredibly, no one ever thought to call animal control or a local rescue to help this bun until the lady posted about it. Our volunteer, Betsy, seeing the post on facebook, drove three hours to rescue him for CCRR. By the time she got back I was ready. But not at all prepared for the bunny before me and I couldn't help but burst into tears at first sight of him. Founder, Jenny Nichols, doing an assessment of the damage to Achilles' back leg. His leg is bent straight out behind him. To make matters worse, he has been living on a terrible diet and because of this his poo and pee has burned him so badly - becoming "trapped" in the awful angle of his leg - leaving him with holes and infection in his pelt. This thick layer of feces was rock-hardened taking forever to gently take off. We bathed his leg and anointed his wounds. After shaving and drying him we then tended to his ear mites. The poor bun didn't move a muscle the entire time. It was if he knew he was finally in safe hands. After making sure he was dry I set him down and was surprised to see that he can actually maneuver around quite well with the broken leg. We wanted to give him a strong name and finally settled on Achilles - whose only week spot was his heel. X-ray take at the Brewer Veterinary Clinic, shows that there were two breaks in Achilles' leg: one at the femur and one lower down. 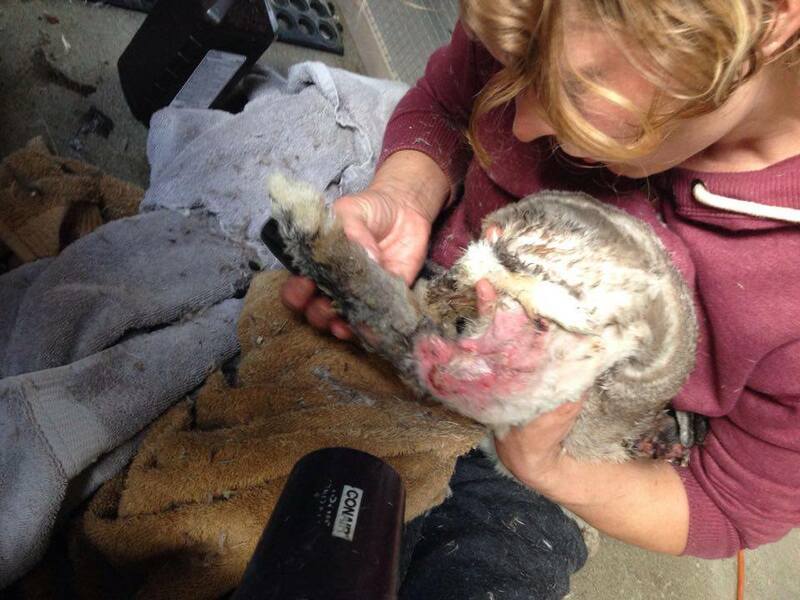 This damage was likely done by a car accident or a struggle with an animal. We plan on continuing treatment on Achilles ears and leg wounds and will give him a few days to settle down and get him on a good diet. And then, when he is feeling better, we will take him for a consultation about what to do about his leg. The obvious solution to me would be surgery and amputation. But this bun is at least four years old, if not older. 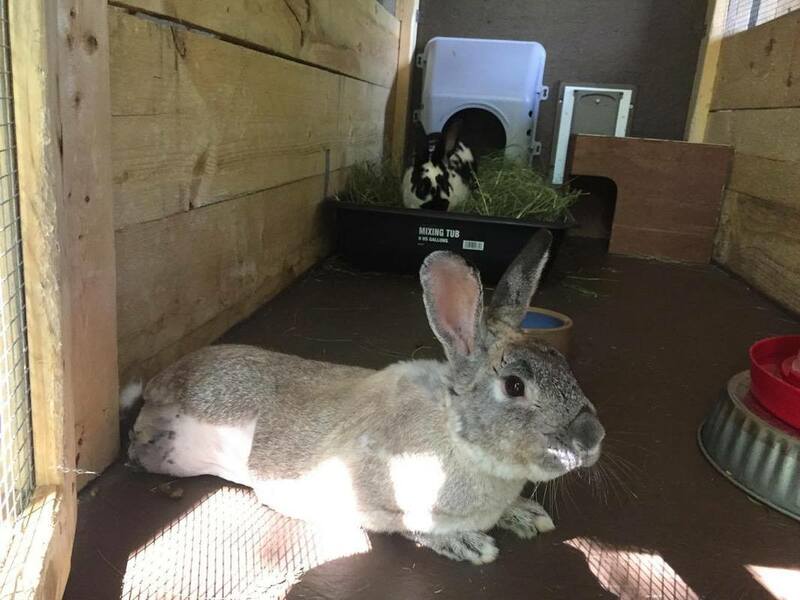 There is a great deal to consider, including finances, and I am praying that animal advocates will come to the front and help this bun get through this. I can't imagine the horrors his life has been. Day 2: It's been a tough morning. I have spent the day at home with Achilles. The look in this buns eyes rips my heart in two and I keep finding myself bawling like a baby as I go throughout my day. I cannot wrap my head around why this neighborhood of people all watched Achilles eating from their trash cans with his broken leg and ear full of mites like they would birds at a feeder. I can just imagine their comments: 'Oh, look, there's that bunny again. Look how good he gets around even with his leg like that!' And all the while, he is suffering and in pain. Terrible pain. Just sitting back with their coffee and tea and enjoying his presence as something to proclaim about. A bit of nature to enjoy! And do nothing. Nothing. For four long years! Leaving him in snow and rain and hail - all the while dragging his foot behind him and living off their scraps. People say all the time how much they LOVE animals. I don't think this is true. I think they love the idea of animals. But when it comes to truly helping a creature. I mean really sacrificing – whether it is out of pocket or physically stepping in – they sit back and sip their tea and remark about what big animal lovers they are. Thank god for this new neighbor who finally spoke out. And thank god for our incredible volunteer who sacrificed her day to bring this bunny home. Because that’s where he now is. Home. With us." Thanks to donations and the help of Dr. Monnier and the amazing staff at the Brewer Veterinary Clinic, we were able to have Achilles' leg successfully amputated. It took nearly two months for Achilles to fully recover from the damages that were the result of the worst kind of human treatment: neglect and disregard. Since then, Achilles is a new boy! We were able to bond him with the love-of-his life - a beautiful, satin, bunny named, Kaida, (which is Japanese for "little warrior" - and she certainly is a little warrior when it comes to her love for Achilles.) She watches over him and rarely leaves his side. Achilles is doing very well and is a fast learner when it comes to getting around as a tripod. He loves to take his turn playing in the picket fence yard outside. We have built him a little handicap ramp to go to the outdoor pen and he has no trouble running around and keeping up with Kaida. Achilles is an incredibly loving and affectionate rabbit. We like to think he has an old soul. If you look deep into his eyes, it's easy to see why. Achilles, enjoying some sunshine, not long after his surgery. It is amazing how the fear and trauma is now gone from his eyes. You can see Kaida in the background. A happy ending.